Speak Schmeak: How are your manners? I'm off to the wine country today for some tasting with a friend. 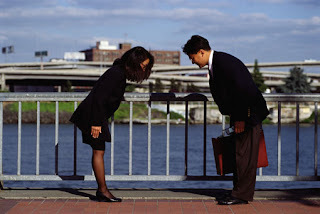 I thought I'd leave you with a link to a post I enjoyed on manners and respect, by my speaking pal Nick R. Thomas. Many of us write and speak about effective presentations, including the necessity for proper preparation, learning about your audience in advance, meeting the needs of the audience, etc. What is often forgotten in these conversations is that it's just plain rude and inconsiderate NOT to prepare properly, learn about your audience and meet their needs. "There is an expression that describes ignorant people: we sometimes say they 'don't know how to go on'. But, of course, some speakers do know how to go on...and on...and on... I'm not talking about overrunning by a few minutes (often with permission) during a successful 45-minute presentation but those people who have to be forcibly stopped after droning on for over an hour - and they are still nowhere near the conclusion of their material. Why? Because they didn't bother to time it and then allow for the fact that it always takes longer on the day." I've written in the past about being inconsiderate, wasting the audience's time, and being a greedy speaker. Check out Nick's take on good manners as a speaker and putting yourself in the audience's shoes. It would be bad-mannered of me not to thank you for this link, Lisa! And it would be terribly rude of me not to acknowledge your comment!